The main character is a young girl named Lily who dreams of becoming a Performer Extraordinaire when she grows up. She attends drama school, and her drama teacher, Miss Oscar, tells her that in order to perform, she needs to firstly 'method act', that is, walk in the character's shoes. So when Lily finds out that they will be acting out scenes from Annie in her next drama class, she decides to step into Annie's shoes and live like an orphan. She sets about doing chores, going without food, making a dress out of a pillowcase to wear to school, and sleeping outside in a tent. 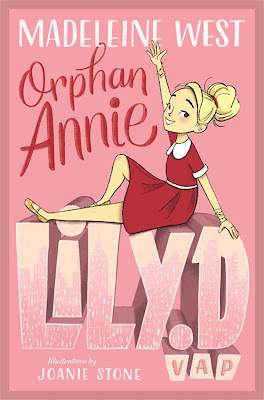 But will Lily's efforts help her to fully understand what it is like to be an orphan, alone and without a family? This book is aimed at junior readers aged 6-8 years old, although my 10 year-old daughter read it and really enjoyed it. Lily.D, V.A.P sends an important message to children - to pursue their dreams and believe in themselves. The story is easy to follow, highly entertaining, and I adored the illustrations (by Joanie Stone). Orphan Annie Lily. D, V.A.P is available now. Other titles in the series include Lost Dorothy and Little Princess Snow Bean.